Perspiration and moisture cause oxidation on electronic components. Using Drying Capsules on daily basis is a cost effective routine to protect your expensive Hearing Devices. 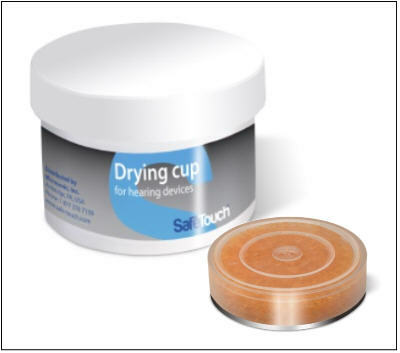 Place your hearing device in the Drying Cup. Leave the capsule to act overnight. The next day, your hearing device will be completely dry. The Silica Gel absorbs moisture and changes color to indicate replacement. The SafeTouch Drying Capsule is orange and will turn to white when it needs to be changed. The dessicant lasts approx. 3 months. This desiccant refill is specifically designed to fit in the The SafeTouch™ Dry Kit. Using Drying Capsules on daily basis is a cost effective routine to protect your expensive Hearing Devices.